The Barina Agricultural School, like so many schools in Sierra Leone, needs to attract quality teachers, and one very good way to do this is by building residential teachers quarters. However at the Barina school there was no safe water source near the proposed new teacher’s quarters. The closest water source is the Rain Water Harvesting (RHW) system, which Bank On Rain installed 2 years prior at the school. The installed system has been successfully providing water for the school since September 2011 but has inadequate storage capacity for additional usage by the teachers, and it is too distant from the new teacher’s quarters. Coupled with this, teachers in Sierra Leone often wait unreasonable lengths of time to be paid, as a result of being compensated by the government. In these cases, provided housing will still attract qualified teachers to a school. So, having a water source at the new teacher’s quarters at Barina was critical to getting qualified staff. It is relevant here to note that there have been several severe outbreaks of cholera in Sierra Leone during the past 12 months, resulting in nearly 400 deaths from contaminated water supplies (http://en.wikipedia.org/wiki/2012_Sierra_Leonean_cholera_outbreak). Bank On Rain (BOR) decided to utilize the teachers, and local workers, in building their own RWH system, with the idea they would later be able to replicate the system elsewhere at other schools ~ which is what has happened ~ and learn to maintain, repair and monitor a system which they had built themselves. Our decision to build the water storage tank with locally available materials resulted in the 10,000 liter tank for the teacher’s quarters being constructed from ISSB (Interlocking Stabilized Soil Blocks) blocks. This was an excellent suggestion, which came from Global Women’s Water Initiative, one of our peers at PWX, and resulted in BOR buying an ISSB press from Makiga Engineering in Kenya and having it shipped to the Barina school. This enabled BOR to train locals, and to build 3 tanks at 2 schools in the area; two projects which had already been funded. The 10,000 liter ISSB tank was constructed between May - August 2013, and has been fully operational since mid August. The foundation was poured cement, and the walls were built of ISSB blocks; with construction of the actual tank by two local stone masons. 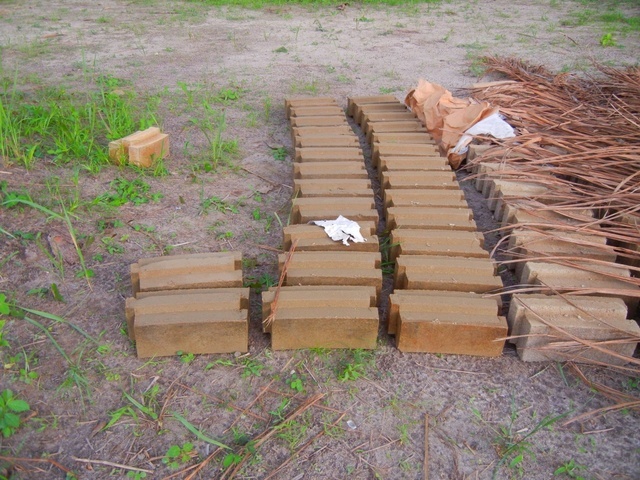 The soil and cement blocks (9 parts soil to 1 part Portland cement), were fabricated by the teachers and students at the school using the ISSB press. The tank interior was then plastered with waterproof cement, and the exterior was covered with a wire mesh plastered with the same waterproof cement. A roof or ‘lid’ incorporating a secure metal access hatch was constructed from steel-reinforced cement (see a video in the field notes for CIC school) The gutter and plumbing supplies were purchased locally in Freetown and installed at the direction of the BOR team which visited in August. Eric Silverman, the BOR ‘man on the ground’, successfully motivated the teachers, students and the two masons to receive training on the first tank for the Barina school, in return for meals. They were motivated with pay to create the blocks, transport them to the site, and build two more tanks at the CIC school, about 6 hours distant. (CIC school is part of the non-profit Schools for Salone) Funding for both the Barina project and the CIC School was from BOR. This funding covered the materials, the ISSB press, transportation of the bricks, meals, and pay for all the workers who built the tanks. Planning and construction for the project was managed and by Eric Silverman, a Peace Corps volunteer at the Barina School, directing a team of 10 teachers & students from the school, assisted by 2 local masons. Eric with the help of the two senior teachers oversaw the entire construction process from foundation preparation, soil analysis, building the bricks with the ISSB machine, constructing the tank and tank roof, to completion and operation. It is currently successfully collecting and storing rainwater, and is a source of pride by the teachers at the school. •	Teachers, students and masons gained real-life know-how to build RWH systems, making them more employable in the future. •	Certificates of Proficiency issued by Bank On rain for all 10 contributors (making them more employable!). 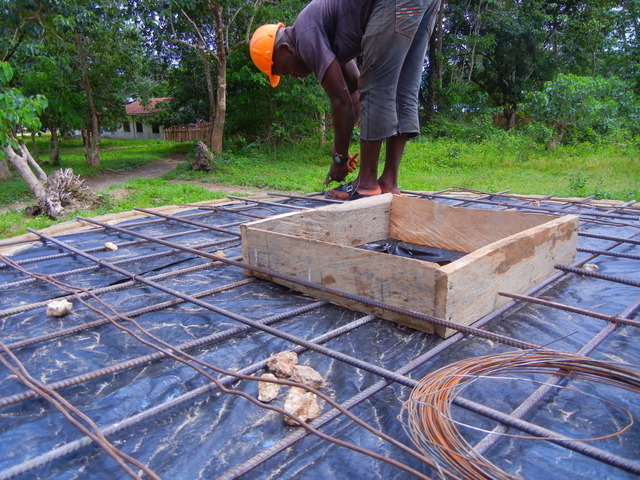 Bank On Rain intends to use Interlocking Stabilzed Soil Block (ISSB) construction to build the storage tank for the rainwater havesting system for the Barina School in Makali, Sierra Leone. We learned that there were no ISSB curved block machines or indivduals trained in its use in Sierra Leone and therefore decided to purchase a block manufacturing machine from the manufacturer in Kenya. The machine was delivered to BOR in the USA today and we intend to become proficient in block manufacture and tank contruction, then ship the machine to Sierra Leone to train school staff while constructing the tank at Barina school as well as tanks for a system designed for the Children In Crisis School in Upper Alen Town. On December 5, 6 and 7, 2012 Mike Williamson initiated a dialogue via email with Eric Silverman, a PCV and teacher at the Barina School. The walls and roof of the teachers quarters have been completed and work is continuing on the interior. The design was discussed and the benefits of using Interlocking Stabilised Soil Blocks (ISSB) for tank construction rather than the plastic tanks originally propose was decided to be worth consideration. ISSB tanks have been built in East Africa, but perhaps have not yet been tried in Sierra Leone. 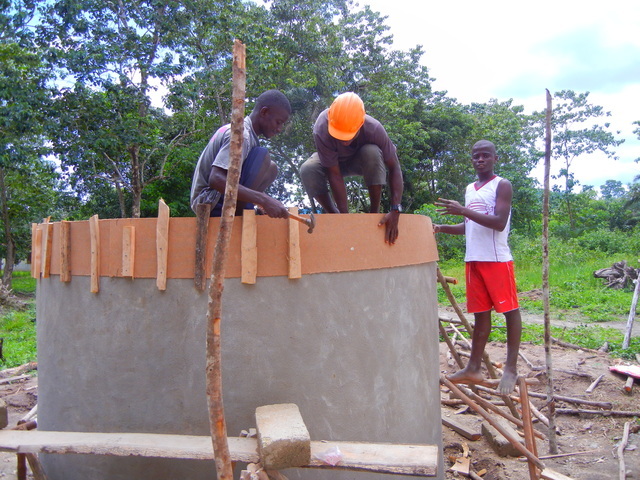 The big plus for ISSB would be that the tank would be constructed on site with labor supplied by the school staff, students and workers from the village. Oversight for the project will be supplied by Bank On Rain, but the production of the ISSB materials can be completed in advance of the actual tank constuctionand installation of the balance of the system. Follow up and reporting continues from one of the teachers at the Barina school who is in communication with Eric Silverman. Additionally, BOR associates in Sierra Leone and Seattle who visit the school will provide further reports. BOR team members will be visiting the Sierra Leone projects every 12-18 months in person. We are instituting a short list of on site people tests and metrics to give us an ongoing data stream from each RWH installation. These include visuals; is the water clear, if not what color is it? Odor testing; is there an absence of odor, if not what is the odor like? Taste test; does it taste clean and pure, if not what does it taste like? We received our first field report from a teacher (Mr. A. Bangura), on 2 October 2013, which said they had cleaned the tank a few weeks ago and the water was clean and odor free when tested thereafter. The weak link in an RWH system is often the faucet, because faucets designed for western pressurized water systems do not function well in gravity fed systems. Our long term solution is the FullStop®Faucet, an original design currently in the prototype testing phase, designed by Mike Williamson, Bank On Rain co-founder. The particular timing of this project was driven by circumstances that resulted in construction during the heaviest rainfall of the wet season, which was not ideal. Eric Silverman, the Peace Corps Volunteer and teacher at the Barina School had extended his service for a 3rd year but his contract was up in mid August, 2013. He had trained the team of students, former students and teachers in ISSB construction and tank building, so it was important that he be able to participate in the project. The rain was an inconvenience and required that tarps were rigged to protect the blocks during the last week of curing and to protect the tank during construction and curing of the mortar and waterproof cement. Transport of materials was a bit more difficult as the roads were in their worse condition. We do prefer to build the tanks at the end of the wet months and would have selected September/October for construction, but the project went well. BOR learned that detailed planning and preparation was necessary to build ISSB blocks from the local soil. The proportions of the components; sand, clay, cement and water, could vary greatly based on the soil composition, temperature, and humidity. Two of the teachers were heavily involved in the analysis process, and will be able to use their knowledge and replicate the process in future projects. We learned that given proper incentives; safe clean drinking water, combined with pay for the implementation, we were able to assemble an effective team, directed on the ground by Eric Silverman. Eric concluded that a couple of the teachers at the Barina school would be able to build other RWH systems with the knowledge they had gained, and with adequate motivation in the form of pay for work. Ten members of the Barina School teachers and staff are living in the new quarters and will depend upon the Rainwater Harvesting System (RWH) for drinking, food preparation, cleaning, washing and sanitation. The quarters have helped the School to attract 4 new teachers to join the staff. In 2011 Bank On Rain installed a RWH system at the nearby Barina School with 20,000 liters of water storage, sufficient to provide clean water for drinking and hand washing for the 300 students, but was not designed to support the additional demands of teachers and staff at the new quarters. The new RWH system will provide the water needs of the resident teachers and staff for drinking, cooking, cleaning and washing. The RWH system will directly benefit the 10 teachers and staff in residence and has been helpful in recruiting additional fully accredited teachers to join the Barina School staff, thereby providing indirect benefit to the student population of 300. Both the RWH system at the teachers quarters and the system at the school serve as demonstrations of the effectiveness of RHW systems to provide a clean, safe water source with sufficient storage to last thoughout the dry season -- a year round supply of safe water available everywhere in Sierra Leone.